Not every United Methodist in Michigan will travel to St. Louis next February to witness the 2019 Special Session of the General Conference. But every clergy and layperson in the state has the opportunity to express himself or herself regarding the important issues coming before that legislative body, thanks to Connectional Conversations hosted by Bishop David Bard. Over the course of ten fall weeks, starting September 25 in Marquette and ending December 6 in Lansing, Bishop Bard will engage participants on the theme, “Weaving the Future.” Each setting also includes members of the Michigan Conference Delegation to General and Jurisdictional Conference, present to listen and to respond. The fruit of the commission’s work is three plans: The Traditionalist Plan, the One Church Plan, and the Connectional Conference Plan. Forty-eight petitions related to these three plans, as well as another 52 related petitions, will be on the legislative slate of the 2019 General Conference. For those considering participation in one of the remaining Connectional Conversations, here’s what to expect based on the session held at Georgetown United Methodist Church on Monday, October 15. Present with the bishop in Georgetown were five delegates and alternates: Rev. Benton Heisler, Rev. Kennetha Bigham-Tsai, Rev. Mary Ivanov, Simmie Proctor, and Laura Witkowski. “You have an excellent delegation,” the Bishop said. “They have been working hard and praying hard.” He explained that The Michigan Conference has a total of four clergy and four lay delegates and will also send a number of alternates to St. Louis. Bishop Bard began the session with a half hour presentation about the values embraced by the commission, overviews of the three plans and the legislative process at General Conference 2019. He stressed that “All three plans have deep theological roots and represent important values in our Wesleyan tradition.” Bishop Bard noted that the majority of the Council of Bishops recommends the One Church Plan. Bishop Bard referred participants to the A Way Forward pages of the Conference website for further study and prayerful reflection. The bishop spent the evening’s remaining hour answering questions from the group. Inquiries ranged across biblical and theological topics, practical considerations around timelines and consequences, the outlook of young people in the church, and the pain and passion experienced by many, regardless of which plan they favor. The evening finished with words of encouragement from the Book of Ephesians and three words the bishop deems important going forward: self-knowledge, openness, and hope. “What if what you want passes but somehow you lost your heart? That would be a huge tragedy,” Bishop Bard concluded. These Connectional Conversations serve several purposes. They are forums for the bishop to present information and resources for gaining additional insight and perspective. They are also opportunities for participants to ask questions and voice their heartfelt thoughts and feelings. And these conversations also provide Michigan’s delegates, who are preparing to head to St. Louis, a window into viewpoints and concerns of the grassroots. 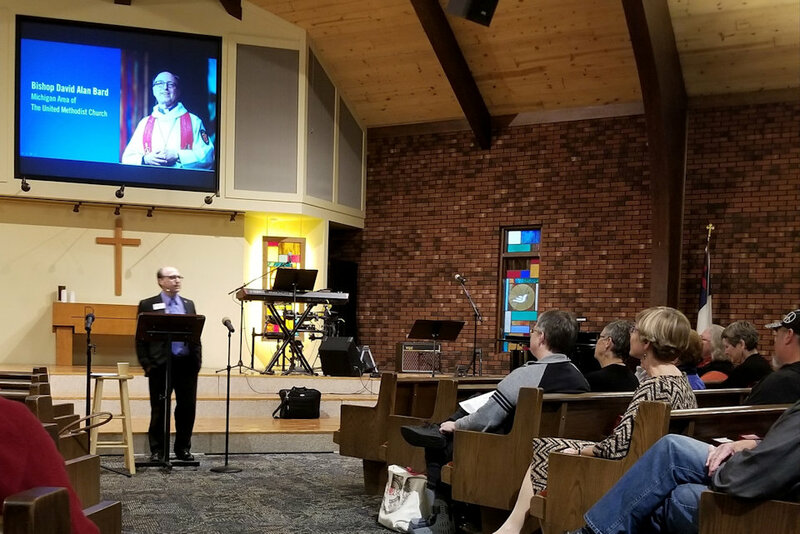 Bishop Bard’s colleagues around the global United Methodist connection are holding similar listening sessions. Find a report here.